Field : A view or entry area in a window where you enter, view, update, or delete information. Flex Credit : A unit of "purchasing power" in a flexible benefits program. An employee uses flex credits, typically expressed in monetary terms, to "purchase" benefits plans and/or levels of coverage within these plans. Flexible Benefits Program : A benefits program that offers employees choices among benefits plans and/or levels of coverage. Typically, employees are given a certain amount of flex credits or moneys with which to "purchase" these benefits plans and/or coverage levels. Flexible Spending Account : FS Under US Internal Revenue Code Section 125, employees can set aside money on a pretax basis to pay for eligible unreimbursed health and dependent care expenses. Annual monetary limits and use-it-or-lose it provisions exist. Accounts are subject to annual maximums and forfeiture rules. Form : A predefined grouping of functions, called from a menu and displayed, if necessary, on several windows. Forms have blocks, regions and fields as their components. Format Mask : A definition of a person-name format. The format mask comprises standard name components, such as title, first name, and last name, in an order appropriate to its purpose and legislation. Format Type : A format-mask classification that identifies the mask's purpose. 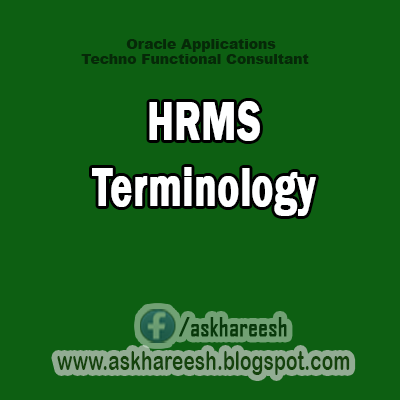 Oracle HRMS defines the Full Name, Display Name, List Name, and Order Name format types. You can also define your own format types for use in custom code. Full Time Equivalent (FTE) : A Workforce Measurement Type (WMT) that measures full time equivalent. Although the actual value and calculation may vary, this value is taken from the Assignment Budget Value (ABV) in Oracle HRMS. If the Assignment Budget Value in Oracle HRMS is not set up then a Fast Formula is used to determine the value to be calculated. Global Value : A value you define for any formula to use. Global values can be dates, numbers or text. Goods or Service Type : A list of goods or services a benefit plan sponsor has approved for reimbursement. Grade : A component of an employee's assignment that defines their level and can be used to control the value of their salary and other compensation elements. Grade Comparation : A comparison of the amount of compensation an employee receives with the mid-point of the valid values defined for his or her grade. Grade Ladder : The key component of Grade/Step Progression. You use a grade ladder to categorize grades, to determine the rules for how an employee progresses from one grade (or step) to the next, and to record the salary rates associated with each grade or step on the ladder. Grade Rate : A value or range of values defined as valid for a given grade. Used for validating employee compensation entries. Grade Scale : A sequence of steps valid for a grade, where each step corresponds to one point on a pay scale. You can place each employee on a point of their grade scale and automatically increment all placements each year, or as required. Grade Step : An increment on a grade scale. Each grade step corresponds to one point on a pay scale. Grandfathered : A term used in Benefits Administration. A person's benefits are said to be grandfathered when a plan changes but they retain the benefits accrued. Group : A component that you define, using the People Group key flexfield, to assign employees to special groups such as pension plans or unions. You can use groups to determine employees' eligibility for certain elements, and to regulate access to payrolls. Group Certificate : In Australia, this is a statement from a legal employer showing employment income of an employee for the financial year..
Headcount(HEAD) : A Workforce Measurement Type (WMT) that measures headcount. Although the actual value and calculation may vary, this value is taken from the Assignment Budget Value (ABV) in Oracle HRMS. If the Assignment Budget Value in Oracle HRMS is not set up then a Fast Formula is used to determine the value to be calculated. HR Staff : In DBI for HRMS the HR Staff are people who work in the Human Resources role. Chief HR Officers can track the ratio of HR professionals to the number of workers in their enterprise.DBI for HRMS uses the HRI_MAP_JOB_JOB_ROLE formula to categorize workers into HR staff and non-HR staff. Headcount Activity : DBI for HRMS uses this term to mean all the gains and losses occurring in a manager's hierarchy during a reporting period. Hierarchy : An organization or position structure showing reporting lines or other relationships. You can use hierarchies for reporting and for controlling access to Oracle HRMS information. High Availability : IRecruitment functionality that enables enterprises to switch between two instances to continuously support the candidate job site. Hire Date : In DBI for HRMS Hire Date is the employee's most recent hire date. Imputed Income : Certain forms of indirect compensation that US Internal Revenue Service Section 79 defines as fringe benefits and taxes the recipient accordingly. Examples include employer payment of group term life insurance premiums over a certain monetary amount, personal use of a company car, and other non-cash awards. Incumbent : In Oracle HRMS and DBI for HRMS, the term Incumbent refers to an active worker (employee or contingent worker). Individual Compensation Distribution : A tool that enables managers assign one-time or recurring awards, bonuses, and allowances to qualified employees such as housing allowances, spot bonuses, and company cars. Also enables employees to enter voluntary contributions, such as savings plans, charitable organizations, and company perquisites. Info Online : A generic framework to integrate Oracle applications with partner applications, enabling users to access information from third-party providers, My Oracle Support (formerly MetaLink) and Learning Management. Initiator : A person who starts a 360 Degree appraisal (Employee or Self) on an individual. An initiator and the appraisee are the only people who can see all appraisal information. Input Values : Values you define to hold information about elements. In Oracle Payroll, input values are processed by formulas to calculate the element's run result. You can define up to fifteen input values for an element. Instructions : An SSHR user assistance component displayed on a web page to describe page functionality. Integrator : Defines all the information that you need to download or upload from a particular window or database view using Web ADI. Interface : A Web ADI term for the item that specifies the columns to be transferred from the Oracle applications database to your desktop or vice versa. Involuntary : Used in turnover to describe employees who have ceased employment with the enterprise not of their own accord, for example, through redundancy. Job : A job is a generic role within a business group, which is independent of any single organization. For example, the jobs "Manager" and "Consultant" can occur in many organizations. Job Posting : An advertisement for a specific vacancy. This is the public side of the vacancy for which a candidate would apply.